Late Hebrew expression for a man who is well informed in rabbinical literature, although not a scholar in the technical sense of the term ("talmid ḥakam"); it does not seem to have been used before the eighteenth century. Ezekiel Katzenellenbogen (1670-1749) decided that rabbinical scholars were exempt from paying taxes even though scholars then were not scholars in the proper sense of the word, "for the law does not make a difference between lamdan and lamdan" (Resp. "Keneset Yeḥezḳel," Ḥoshen Mishpaṭ, No. 95, p. 118a, Altona, 1732). 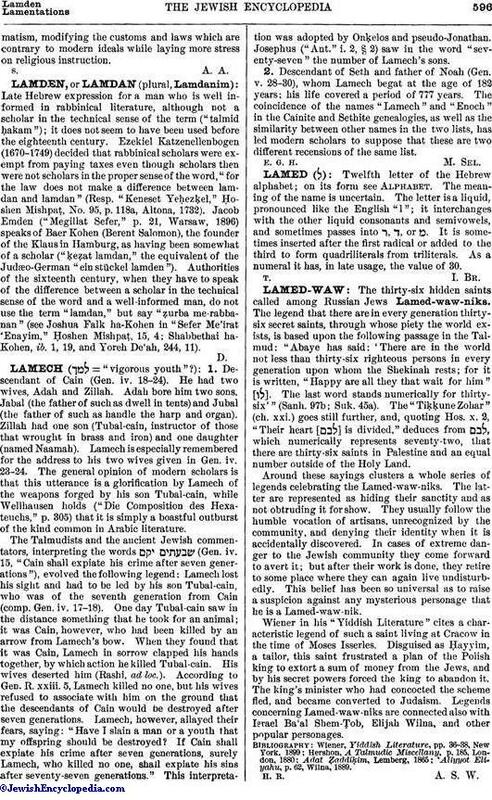 Jacob Emden ("Megillat Sefer," p. 21, Warsaw, 1896) speaks of Baer Kohen (Berent Salomon), the founder of the Klaus in Hamburg, as having been somewhat of a scholar ("ḳeẓat lamdan," the equivalent of the Judæo-German "ein stückel lamden"). Authorities of the sixteenth century, when they have to speak of the difference between a scholar in the technical sense of the word and a well-informed man, do not use the term "lamdan," but say "ẓurba me-rabbanan" (see Joshua Falk ha-Kohen in "Sefer Me'irat 'Enayim," Ḥoshen Mishpaṭ, 15, 4; Shabbethai ha-Kohen, ib. 1, 19, and Yoreh De'ah, 244, 11).